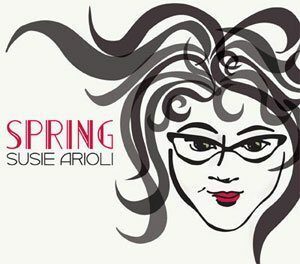 Canadian jazz singer Susie Arioli on her prior recordings has generally been teamed up with guitarist Jordan Officer, performing swing standards in intimate settings. Her recent Spring is a bit different in that she is joined by an octet filled with some of Canada’s finest musicians including tenor-saxophonist Phil Dwyer, trumpeter Kevin Turcotte, guitarist Reg Schwager, Don Thompson (who arranged the pieces) on piano and vibes, bassist Neil Swainson, and drummer Terry Clarke. Also different is that, in addition to such vintage tunes as “Mean To Me,” the Jimmy Rushing near-blues “Evenin’,” “Me, Myself And I,” “Travelin’ Light,” and “After You’ve Gone,” the singer contributed four originals. But while Thompson’s arrangements and the concise solos are sometimes reminiscent of 1950s West Coast jazz (with some of the songs having a vibes-guitar sound that recalls the George Shearing Quintet), Ms. Arioli’s style is unchanged. She has always had a fetching voice, is expert at placing her notes, and has a slight and appealing country twang in her swinging vocals. Her relaxed singing is quietly infectious and it is quite enjoyable to hear her in this new setting.